If you are looking for a completely unique dining experience, then go try French fare at Parc Brasserie. Their traditional bistro food and warm, inviting setting are sure to please! Stop in for breakfast and try guest favorites like their Polenta and Eggs Basquaise, the Ham and Gruyere Croissant, scrambled eggs with asparagus, or the toasted bagel with Norwegian smoked salmon and creme cheese. Pair your breakfast with a delicious mimosa Lorraine and you’ll be a happy camper. The lunch menu has fantastic selections like Steak Tartare with capers and quail egg, Escargot with hazelnut butter, Tuna Carpaccio with Leek Vinaigrette, and chicken liver parfait in a red wine gelee. Finally, consider bringing that special someone in for a romantic dinner. Popular dinner items include Lobster Risotto, Veal Milanese, Prime Rib a La Provencale, and the Rotisserie Leg of Lamb. If you save room for dessert, have a traditional creme brulee, or go for the Baba au Rhum – which is a sponge cake soaked in a citrus syrup and dark rum, with vanilla creme Chantilly. 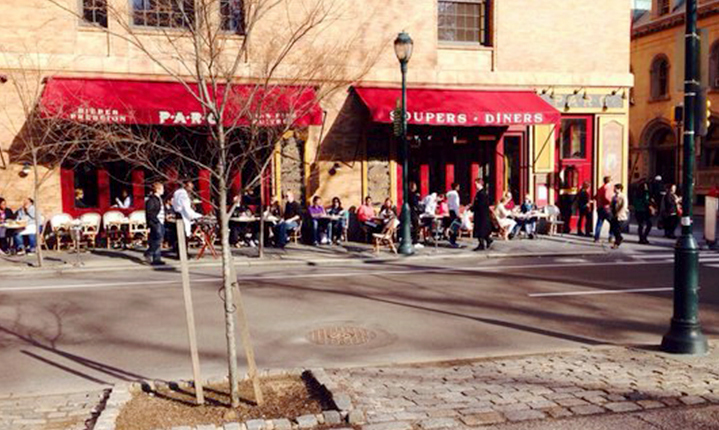 Parc Brasserie is located at 227 South 18th Street in Philadelphia. For more information, or to make reservations, call them at 215-545-2262.